Unknown, after Thomas Gainsborough (1727-88). David Garrick Leaning on a Bust of Shakespeare. Oil on canvas, after 1769. The original painting by Gainsborough was destroyed by fire in 1946. Folger Shakespeare Library. In commemoration of the approximate 200th anniversary of Shakespeare’s birth, the London actor and theatrical entrepreneur David Garrick launched the first celebration of Shakespeare as “the god of our idolatry” in 1769, helping to fashion the Bard as the larger-than-life, iconic representation of English literary achievement. The events that Garrick planned on the sacred site of Shakespeare’s birthplace, Stratford-upon-Avon, included everything from a concert of music to fireworks and a horse race, although not, significantly, a Shakespeare play. Garrick’s emphasis was on Shakespeare the man, the “Warwickshire lad” who put a human face on literary greatness even in his debut moment as public spectacle and national icon. Signed “F. Westwood”. Medallions commemorating the Jubilee, 1769. 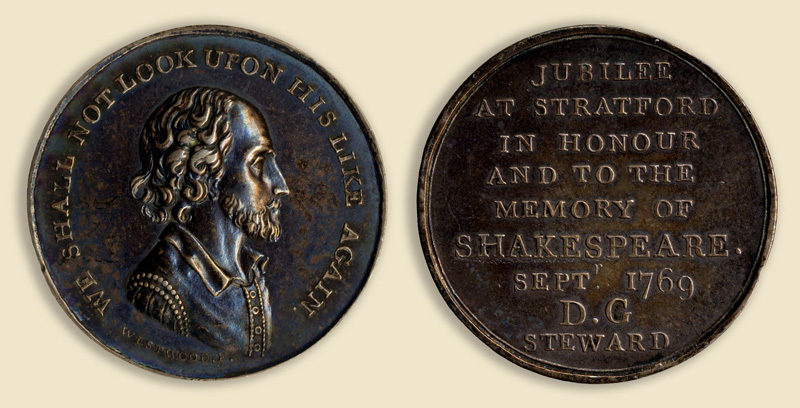 Recto: “We shall not look upon his like again.” Verso: “Jubilee at Stratford in honour and to the memory of Shakespeare, Sept. 1769, D.G., Steward”. Folger Shakespeare Library. Paradoxically, making Shakespeare larger than life had the effect of bringing him up close and personal to his fans: Shakespeare is arguably one of two British authors whom we call by their first names today. The other one, of course, is Jane Austen, and these two literary super-stars are the subjects of Will & Jane: Shakespeare, Austen, and the Cult of Celebrity, on exhibit at the Folger through Nov. 6. A mere two decades after the Jubilee at Stratford-upon-Avon, businessman John Boydell opened the doors of his fashionable Shakespeare Gallery on the Mall in London, filled with “big hit” scenes from Shakespeare’s plays painted on life-sized canvases by a range of contemporary artists. While this first Shakespeare museum was ultimately a financial failure, for a decade and a half before it closed in 1804 it was the place to go to binge watch Shakespeare during the London “season.” Boydell’s gallery had a large shop that sold engraved prints of the paintings. These handsome engravings provide a valuable record of the compositions of the many original paintings that have now disappeared. George Romney (1734-1802). 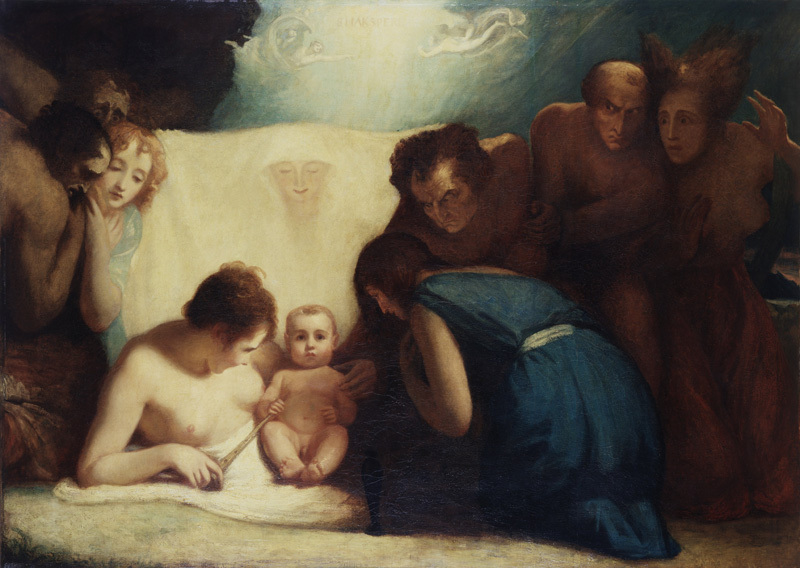 The Infant Shakespeare Attended by Nature and the Passions. London, 1791-92. Oil on canvas. Folger Shakespeare Library. The What Jane Saw website (www.whatjanesaw.org) painstakingly reconstructs the eighteenth-century Shakespeare Gallery so that modern visitors might imagine what it would have been like to stroll through it during its heyday. In addition, the Folger owns several examples of the few surviving paintings, including George Romney’s The Infant Shakespeare attended by Nature and the Passions, a literary nativity scene now on display in all its glory in the Great Hall as part of Will & Jane. Obviously not a scene from any play, this “baby Shakespeare” arrests visitors to the Folger with solemn infant eyes, evoking in his nakedness and vulnerability the sense of intimacy that Garrick’s audience might have felt with the “Warwickshire lad” in 1769. 200 years seems to be a linchpin anniversary. Will & Jane takes us fast forward to 1995, when another writer began her meteoric rise to literary stardom in a parallel moment of public spectacle and worship: the BBC’s television adaptation of Pride and Prejudice. 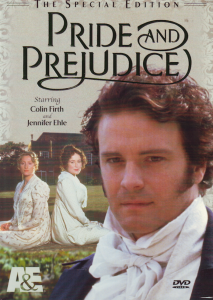 The desiring gaze of Elizabeth Bennet (played by Jennifer Ehle) on the manly charms of a wet-shirted Darcy (played by Colin Firth) triggered a small tsunami of Jane Austen adaptations at roughly her 200 mark. It also sparked a new interest in Jane herself. Who was this woman who authored some of the greatest love stories of our time? Did she fall in love like her heroines? Oh, surely, she did, suggested the film Becoming Jane—but with whom, when, and how? The fact that we have almost as little biographical information about Austen as we do about Shakespeare has not stopped us from imagining rich love lives for both of them. Hail the modern biopic, from Shakespeare in Love to Miss Austen Regrets. As eager fans, we want to reward the writers who have given us so many peak moments of vicarious romance with rich love lives of their own. In both cases, fans also crave the intimacy with their beloved writers that comes from personal knowledge. Both Will and Jane became public spectacles at, roughly, the 200th anniversaries of their literary afterlives. What is there about that 200-year mark that provoked the urge to celebrate these authors into spectacular celebrity? Will & Jane offers both a few answers to that question as well as plenty of opportunities to get up close and personal with the two authors whom we know on a first-name basis.